I wasn't very into Easter this year. 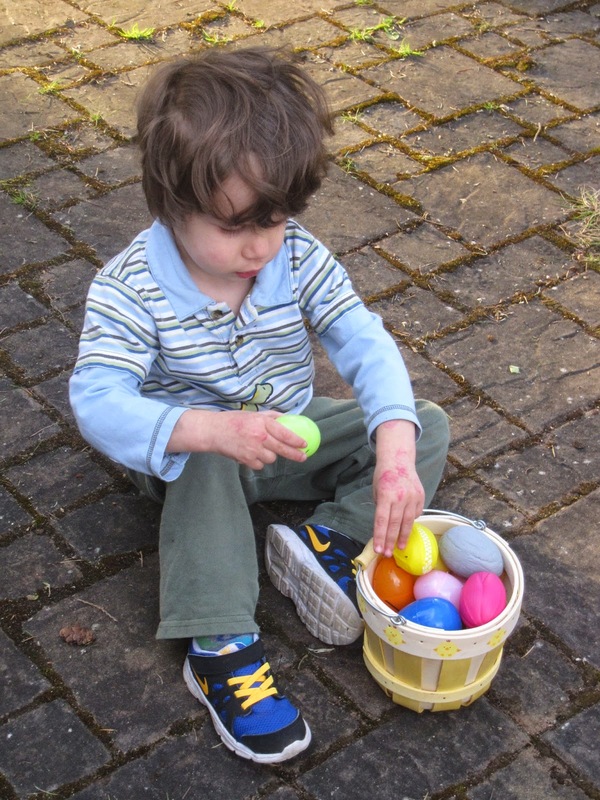 I remember feeling like it was just behind Christmas in excitement when I was a kid (egg decorating, candy, egg hunts) and figured I'd love doing those things for my kids when I grew up. But for years it's just fallen flat. So I put in minimal effort this year and am glad I did. 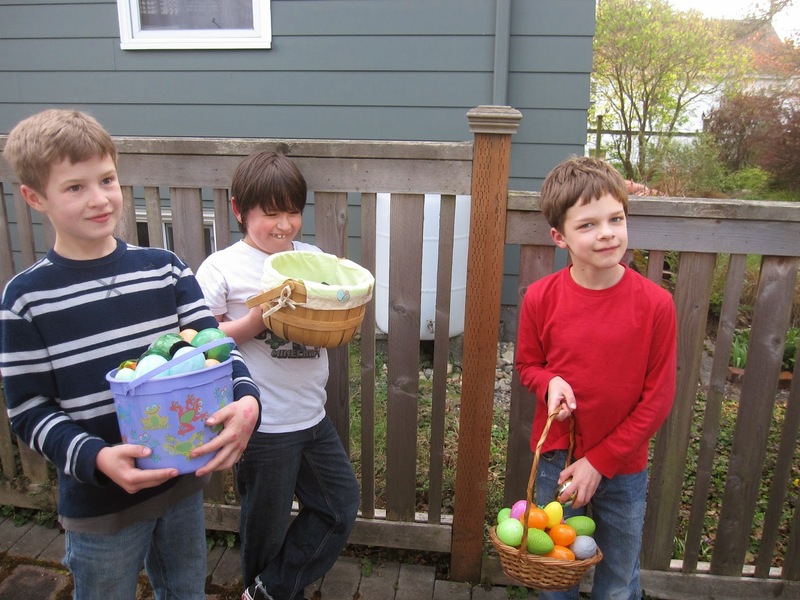 Each of the boys got an egg with a few jelly beans, an egg with a chocolate candy, a bag of animal crackers and a mini stamp and ink pad in their basket. Gareth also got a jump rope. The stamps/ink pads and jump rope were leftover from Christmas countdown purchasing. That was it. And they were thrilled with it. 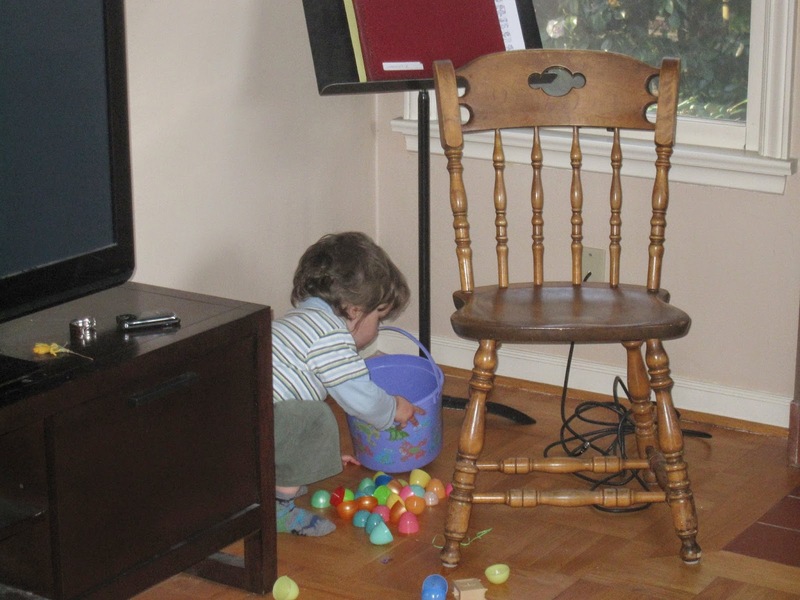 Gareth had no idea it was Easter, so he was surprised to have anything at all. 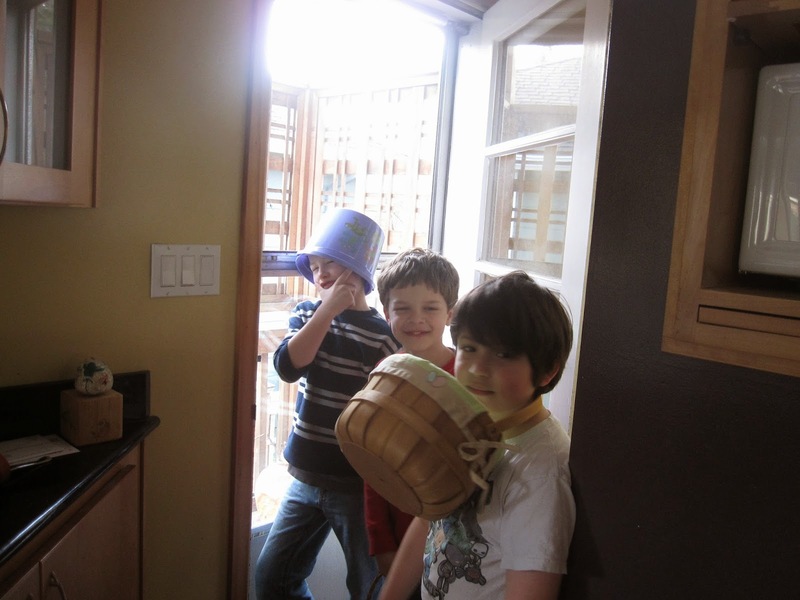 I realized the baskets don't need to be full to the brim in order for them to be enjoyed. At noon we went to a friend's house for an egg hunt/brunch. There were lots of people we didn't know, but several we did. Gareth enjoyed playing with some friends who don't go to his school anymore, Malcolm enjoyed eating all the cantaloupe and strawberries. 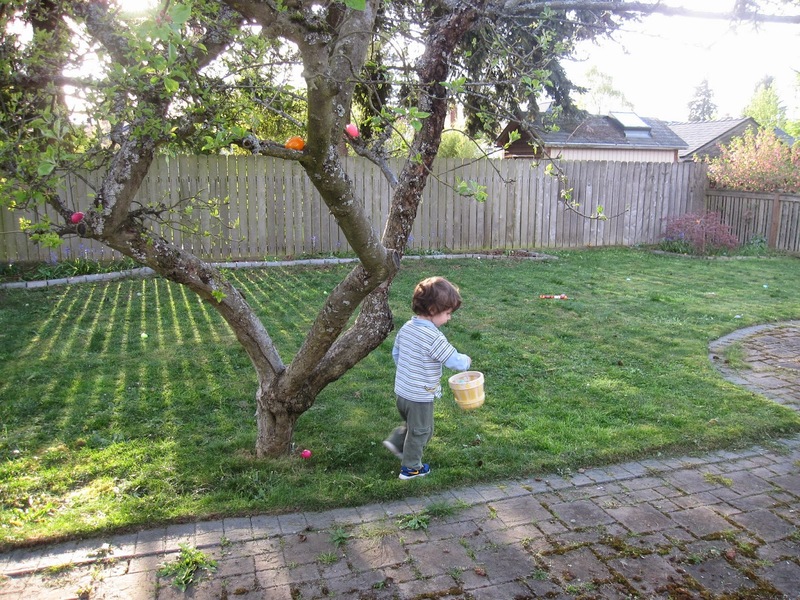 Gareth had a hard time finding eggs at that hunt, so Malcolm shared some (I snuck some from his basket when he wasn't looking) with Gareth. They'd let the little kids start first, so he had several to Gareth's one. I did take my camera (and my phone), but still failed to take any pictures. Even when Mal was being super-cute up in the tree house. 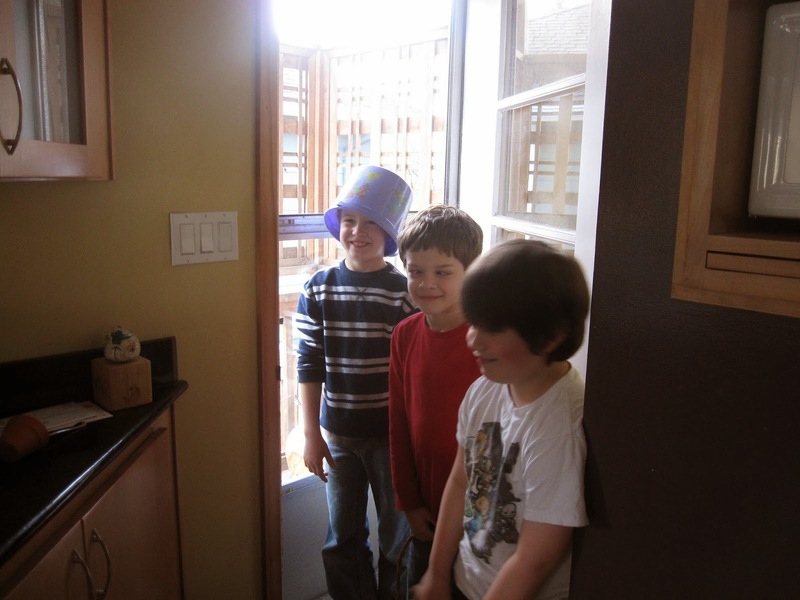 Then we came home and got our ham in the oven. We had friends coming over for dinner - I'd been chatting with them after school on Friday and we were all discussing our lack of enthusiasm for the holiday, so I invited them to come over for ham. They brought side dishes and dessert. We had ten of us in all and it worked surprisingly well considering our small space. 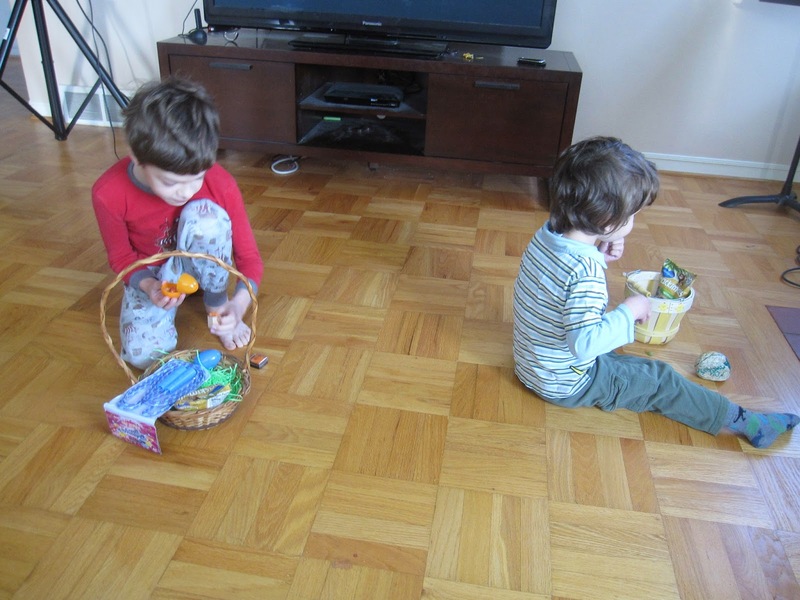 Noisy, because wood floors and three seven/eight year olds is a recipe for noise. But we had a fun time (I'm not sure how the lone 8th grader enjoyed it, but the rest of us did!). 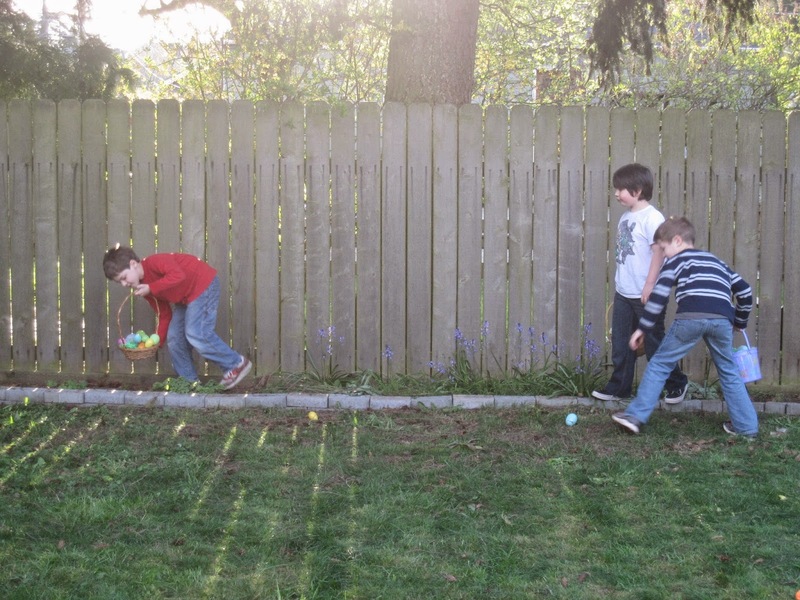 We did an egg hunt for the boys in the back yard, so if they felt they hadn't had enough candy earlier, they got plenty then. Ready to go hunting. "I uv eggs!" was his refrain by end of day. Hunting's not too hard in our yard, especially since I cut the grass the day before. But there were still some weeds in the beds to help hide some eggs! 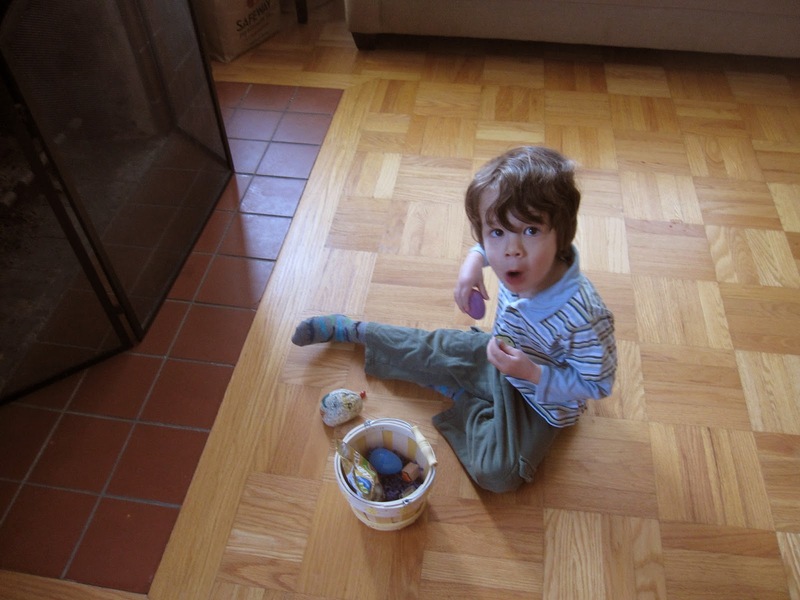 Things ended on a less good note (for the kids) when we discovered the boys had smashed several of their eggs filled with goldfish crackers all over our basement floor. I was glad there were no jelly beans smashed into the carpet, but none of us were thrilled to see the mess they made. 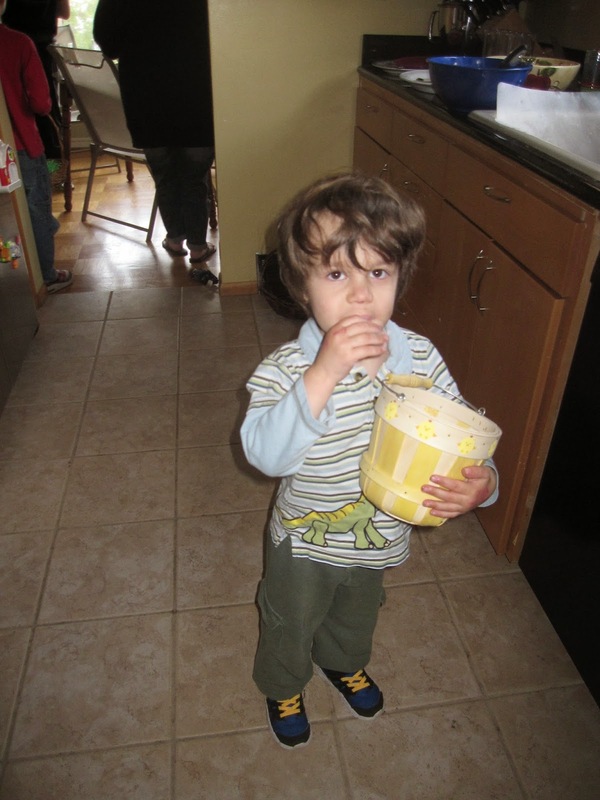 After his friends had left, Gareth got the "we're disappointed" lecture from both of us, vacuumed up the floor before going to bed, and somehow thought that was a good time to try to negotiate a later bedtime. Nope, not happening now kid. But aside from that, it turned out to be a good day. You have a beautiful backyard! Glad you were able to have some fun.